Craving Carbs? Pick Pasta Exercise vs. Movement: What Matters Most? We’ve all heard that antioxidants provide numerous health benefits and in this article, I want to focus on one of them: chocolate. I have to single out chocolate because we hear so much about it in the news and because it is a pleasure-providing food: most everyone would rather indulge in a little chocolate than eat more broccoli if given the choice! There is a lot of research out there about the benefits of chocolate and recently a large meta-analysis concluded that chocolate can reduce the risk of developing cardiometabolic disorders which can lead to coronary heart disease, stroke and type 2 diabetes. Cardiometabolic disorders refers to a set of risk factors that include high blood pressure, high cholesterol, elevated fasting glucose, elevated triglycerides, and abdominal obesity. The researchers pooled the results of 7 studies which included more than 114,000 participants and found that in 5 of the 7 studies “levels of chocolate consumption seem to be associated with a substantial reduction in the risk of cardiometabolic disorders” including a 37% reduction in cardiovascular disease, a 29% reduction in stroke and a reduction in c-reactive protein of 17%. This isn’t the first time chocolate has hit the news. Researchers found five years ago that dark chcocolate acts like aspirin in reducing the clumping of platelets which cause blood to clot. If the clot is formed because the platelets clump and it blocks a blood vessel, it can mean a fatal heart attack. Three years ago researchers working with diabetic patients found that upon giving them a special high-flavanol cocoa drink for a month they brought their blood vessel function from severely impaired back to normal. The improvement was comparable to what is seen upon introduction of exercise and many diabetes medications. And recently, researchers found that a flavanoid in dark chocolate known as epicatechin can increase cellular signals that shield nerve cells from damage and can protect the brain after a stroke, Strokes are similar to heart attacks in that the blood supply is blocked, but in a stroke, that occurs in your brain instead of your heart. The problem is that when the brain is deprived of oxygen and nutrients, cells begin to die within minutes. These anti-oxidant epicatechins (also found in red wine, tea and certain fruits and vegetables) stimulate two nerve pathways known to shield nerve cells in your brain from damage. So when animals were fed epicatechins an hour and a half before a stroke, it was like their brain was on ‘stand-by’ ready to protect itself because the pathways were activated and so less brain damage occurred. So what’s not to like! Here’s the key though: it’s all about the kind of chocolate and how much you consume. You’ve probably heard that all the benefits occur with darker chocolate and that is true. 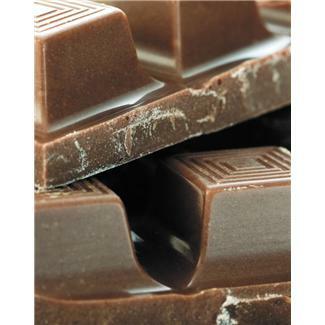 Milk chocolate not only affords no benefits, it contains milk and excess sugar which cancels out the antioxidant effect. Stick with unsweetened baking chocolate and dark chocolate with greater than 70% cacao. Yes, it’s more bitter, but that’s why it has the benefits; it hasn’t been processed. Also read the label to avoid unnecessary fillers when possible. The other key is that this does not give you free reign to eat chocolate all day! One study showed that the ideal amount for protection against inflammation and cardiovascular disease was just under 7 grams a day. That amounts to just less than a half a bar a week. Eating more than that cancelled out the benefits. So we’re talking a bite or two a day, not a bar or two! But knowing that a couple bites a day of a powerful antioxidant can have such a big impact, perhaps that will inspire you to consume more of other known antioxidants as well. Either way, if you are looking for something sweet to end your day, you can’t go wrong with a piece or two of dark chocolate. Enjoy!